There’s nothing better than a big bowl of popcorn to keep the family snack happy. But why not make it extra festive at this time of year with my recipe for this peppermint candy cane version! 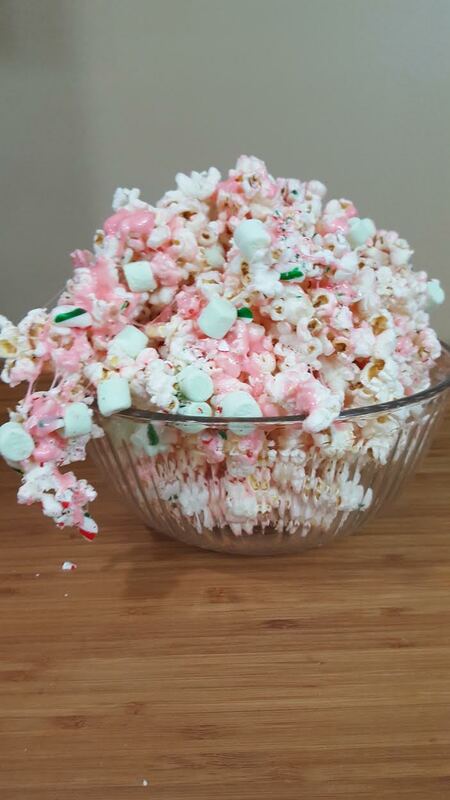 This Christmas themed popcorn is super easy to make. 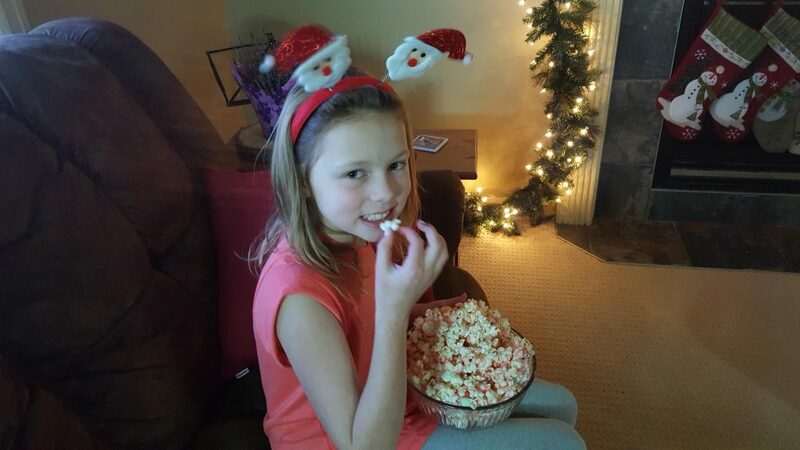 You can use your own home-popped popcorn or the ready popped variety is fine too, add crushed candy canes & mini marshmallows and you have the perfect snack while the family is snuggled up watching your favourite Christmas movie. Most Candy Cane Popcorn recipes we’ve seen use white chocolate, but I am not a huge fan, so this recipe is more similar to kettle corn, and it is amazingly delicious accented by the bright peppermint flavour. Plus it’s crazy easy to whip up a batch of this Peppermint Candy Cane Popcorn, which makes it the perfect treat to share this holiday season. Make your popcorn extra festive and whip up a batch of this Candy Cane Popcorn,the perfect treat to share this holiday season. 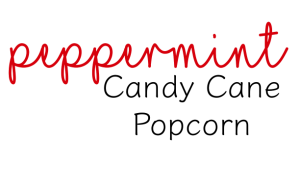 Begin by melting the butter add the peppermint extract,salt and 3 cups of mini marshmallows together in a large pan stirring until melted. Pour about 3/4 of the marshmallow mixture over the popcorn. Using the wooden spoon, gently fold the marshmallow mixture in with the popcorn until it is mostly covered. If you are making your own popcorn be sure not to let any un-popped kernels into the pot (nobody wants a chipped tooth!). Stir gently until popcorn is evenly coated. Now pour the popcorn onto a cookie sheet covered with parchment paper. Drizzle the remaining marshmallow mixture over the popcorn but do not mix. You will need the mixture at the top so the candy will have something to stick to. Don’t wait too long to add the candy! Allow the popcorn to cool & break apart into pieces and serve. 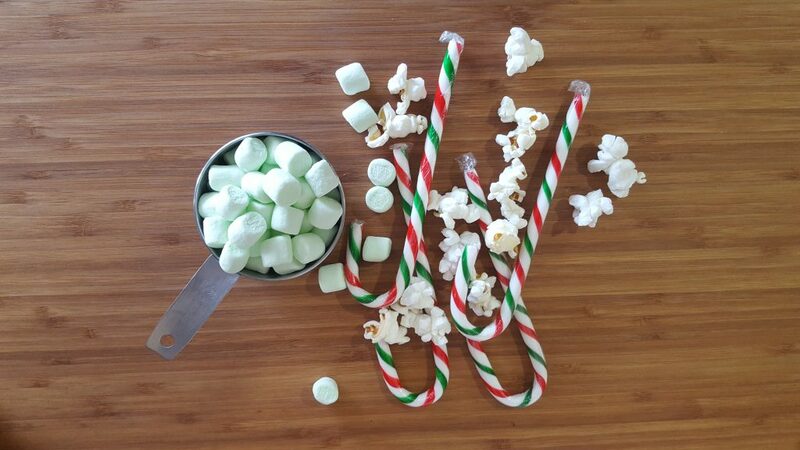 If you desire a stronger candy cane flavour, add 1/2 tsp of peppermint extract to the marshmallows while melting. Enjoy warm or spread out on parchment paper to cool and then place in a tin for later. Here is the candy that we added to our Candy Corn Popcorn. We used 1/2 cup of green mini marshmallows and our crushed candy canes . Does your family enjoy popcorn for a game night or even a movie night? If you make this Peppermint Candy Cane recipe I’d love to see a photo in the comments below! So throw on a flick, curl up in a blankest, and eat some flavoured popcorn. Your inner child will thank you! Now I know what to do with all of these leftover candy canes! We have a huge popcorn maker, this will make a great treat for the kids! oh my that sounds amaxing, I am drooling! What a yummy Christmas treat, my kids would love it! We love to watch movies together as a family. This would be a great way to make popcorn for the holidays and share together. This would be something that my son would enjoy making and eating! Fun food is always a win! yum! my kids requested this for Christmas but I didn’t have the recipe. thanks for sharing. it looks delicious! this looks so decadent and like the quintessential holiday treat! we always have tons of candy canes and now we have a great recipe for them! This looks seriously delish! I am all over candy can anything this time of the year. I love popcorn and can almost eat them everyday. Totally loving the candy cane popcorn idea and would be making them soon. What a great idea. Popcorn is also a color becomes! Kids liked it, thank you! Oh my goodness. I love peppermint and this just sounds amazing!!! This popcorn looks sooo good! My son would loooove this. Thanks for sharing it! Mmmm you definitely had me at popcorn! I’m willing to try it in all forms! Yum! What a creative way of putting those candy canes to use! Definitley going to try this at home. Oh yum! 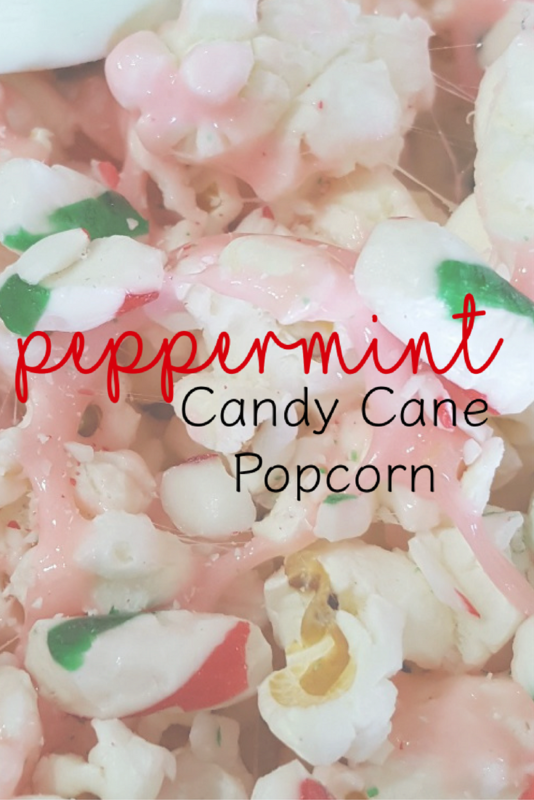 My son loves popcorn and peppermint… so he would definitely enjoy this treat! These popcorn looks so yummy and absolutely easy to make. Will try your recipe soon. Oh, this sounds amazing. 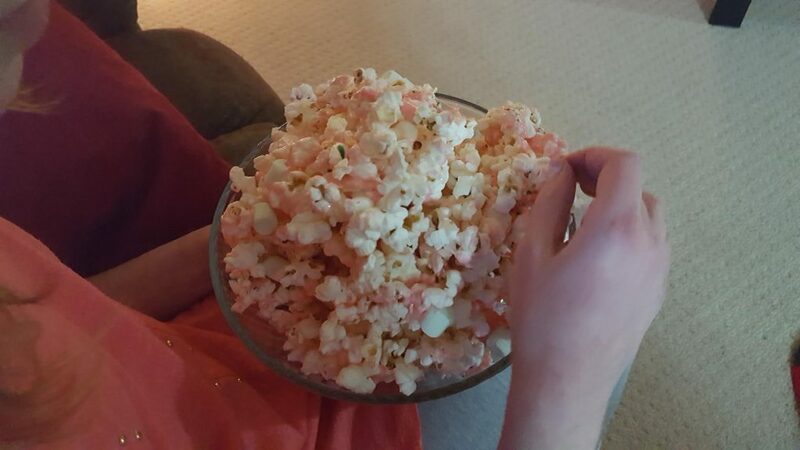 I’m a popcorn fanatic to begin with, and adding peppermint takes it to a whole new level! I love peppermint so much but I can’t picture how this tastes, I can’t picture it even a little. This of course means I MUST make it for the family because now I must know! This popcorn looks sooo good! My kids would love this. Thanks for sharing the recipe! OH yum! We have movie nights with popcorn and I sometimes put in a few small pieces of chocolate, but this would be a fun and festive surprise for my kids. Thanks for the idea! What a great idea for popcorn over the holidays! I can’t wait to try this! My son will love it too! Now see, I’m trying not to eat too much during the holidays but this is just too tempting! I love peppermint and marshmallows, those look so good! Pretty sure my kids would eat the entire batch of this popcorn!!! They are obsessed with popcorn. This looks so yummy! This is the perfect festive treat. I’m sure it would be the hit of any party. Happy Holidays!! I love candy canes and I love popcorn. This is a match made in heaven. Totally delish! Oh my goodness I am in heaven. This looks so good. I’ll be over for a snack. I can’t imagine trying to get this all out of my teeth, but it does look tasty and different!